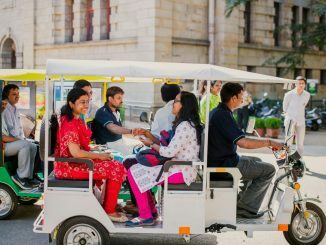 Bengaluru has thousands of two-stroke auto rickshaws, which have proved to be a bane in the scheme of things where shift to eco-friendly vehicles needs to happen quickly to counter the air pollution crisis the city is facing. And this is taking time, as the government’s plans seem to be ineffective. In November 2018, Radio Active 90.4 MHz CR a community radio station did a study of government’s plan to phase out 2-stroke autos and move to 4-stroke autos. They held a focus group discussion with auto drivers to discuss the challenges and opportunities in making the shift. Tracing the journey, the study noted how the State government felt the need to replace two-stroke autos long back in 2011. The owners of two-stroke autos were then asked to upgrade their vehicles to four-stroke autos, preferably modified for LPG fuel. 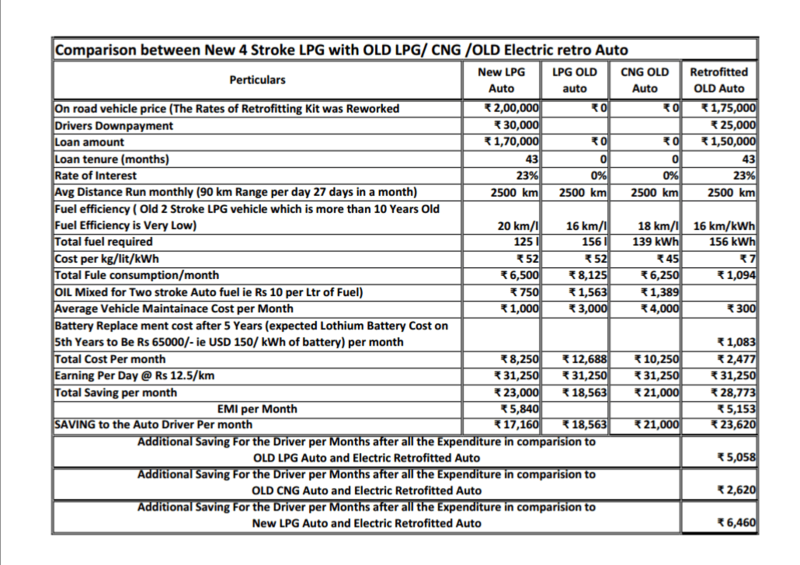 In order to aid auto drivers retrofitting their autos with LPG kits from approved centres, a subsidy of Rs. 2000 was given. This scheme was closed in 2014-15. The Radio Active article explains that the Government of Karnataka in a notification dated July 8, 2011, also ordered a subsidy of Rs. 15,000 to the auto drivers who had valid autorickshaw permits and two-stroke autos registered before April 1, 2000 in Bengaluru and other 11 places in Karnataka, who were willing to replace the two-stroke autos with four-stroke autos. This scheme was closed in March 2013, but a new scheme with a subsidy of Rs 30,000 replaced it in 2014. Initially, drivers would sell their vehicles off to places outside Bengaluru limits, making anywhere between Rs. 25,000 and Rs. 50,000. This amount, in addition to the Rs. 30,000 given by the government, was what helped them pay for their new four-stroke autos. However, this did not solve the problem of the amount of pollution these vehicles caused, because the sold autos were simply used elsewhere. So in 2017, the Autorickshaw Scrap Policy was introduced. Joint Commissioner for Transport (Environment and e-Governance), M.P. Omkareshwari says that the scheme made it mandatory for the auto drivers to get their autos scrapped at any of the three scrapping centres in Bengaluru (in Goraguntepalya, Nelamangala and Peenya), and on producing a certificate from scrapping units, they would receive the subsidy. She says there were about 27,000 two-stroke autos that were plying on Bengaluru’s roads. “When we had implemented the Autorickshaw Scrap Policy in 2017, we were allocated a budget of Rs 30 crore towards distribution of subsidy,” she said. “But almost no one availed of it,” she added. This, despite a lot of publicity given through notices in transport offices, pamphlets and various awareness programmes. But the State Transport Department doesn’t seem to be aware of the problem auto drivers are facing. Auto drivers’ unions then requested that the subsidy be increased to Rs. 50,000 as the prevailing amount would not be enough. The government eventually extended the deadline of the ban to March 2020, after which Fitness Certificates would not be issued for two-stroke autos. Most auto drivers are continuing to use their two-stroke autos. The problem continues to exist with a renewed deadline for its elimination. Going electric has been a solution the government of Karnataka has been considering. 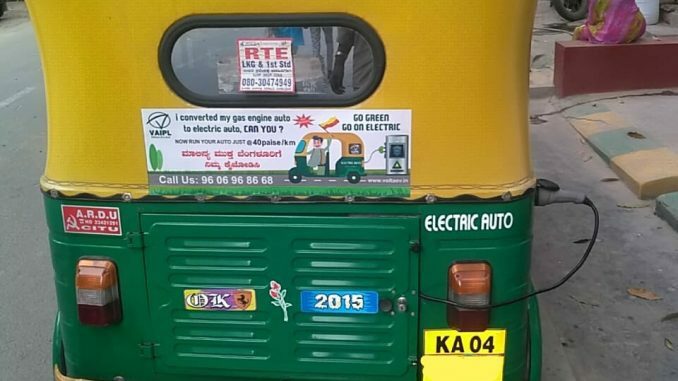 In order to encourage the use of electric vehicles, the Government of Karnataka exempted all electric non-transport and transport vehicles including e-rickshaws and e-cart from payment of taxes under Karnataka Motor Vehicles Taxation Act 1957 with effect from 01/04/2016. Former chief minister Siddaramaiah’s Budget Speech in the year 2017-2018 announced the intent of Government of Karnataka to make Bengaluru the Electrical Vehicle Capital of India. After a round of discussions with stakeholders from the electric vehicle industry, the Center for Study of Science, Technology and Policy (CSTEP) and other stakeholders, the Government decided to formulate the Karnataka Electric Vehicle and Energy Storage Policy. Four-stroke autos are better than two-stroke ones as far as emission is concerned. However, they are not emission-free. Another solution is to convert the two-stroke autos into electric autos, thereby eliminating all emissions at once. Auto drivers can retrofit their old two-stroke autos with an electric engine. Citizen Matters spoke to Madhan B N of Volta Automotive India Pvt Ltd, one of the companies that has the technology to convert two-stroke autos into electric ones. He said the retrofitted autos would be noiseless, non-polluting and would require less maintenance than the two-stroke or four-stroke engines. The problem is this: currently this scheme is not supported with government subsidies and loan facility. With the same subsidy of Rs 30,000 given to two-stroke autos to buy four-stroke autos, and with some loan facility, the autos can easily be retrofitted with electric engine. The company even has a calculation of the savings the auto drivers can make. The retrofitted autos would be powered by Lithium batteries which consume 6 units of power to run 90 km – that is, Rs 0.40 per km, which is way less than the cost of Rs 3.50 per km incurred for a four-stroke auto. The batteries that cost about Rs 60,000 would need to be replaced once in every five years. Omkareshwari said that the Transport Department had put a proposal forward regarding higher subsidies for those purchasing electric autos, which is yet to be approved. She added that 5,000 electric auto permits had been approved, and that Mahindra had been allowed to begin sale of their electric autos. This article is part of a special series: Air Quality in our Cities, and explores the root causes for air pollution and solutions for improving air quality in Bengaluru and Chennai. The series is supported with a grant from Climate Trends. Rahna Jacob is an Intern at Citizen Matters. 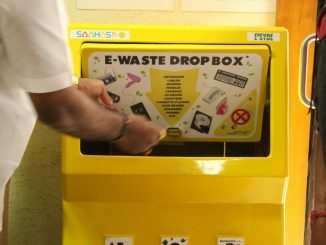 The bE initiative has setup e-Waste collection at Bangalore One centres in 10 wards so far. 3 tonnes of e-waste has been collected and 830 kgs of carbon emissions reduced! As the transport department struggles to phase out two-stroke autos, here is what an official has to say about the challenges of introducing e-autos on Bangalore roads. Cycle Day captures the flavour of old Bangalore, when the streets were congestion free and pedestrian friendly.